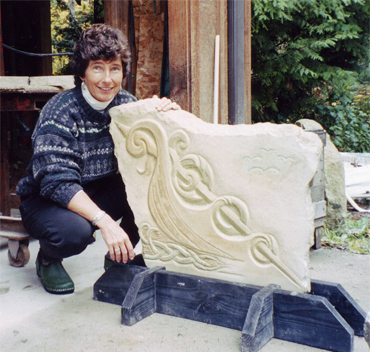 Bainbridge Island sculptor Molly Greist, renowned for her work with native stone, was designated by the art selection committee of the Bainbridge Public Library to carve the cornerstone of the new building. The massive rock was turned up onsite during the excavation for the new wing of the library in 1996. Architects, designers and library users were so fascinated by the stone they decided rather than attempt to move it they would build the library around it, emphasizing the indoor/outdoor features of the new building. 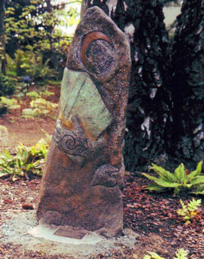 Sculptor Greist incorporated symbols representing the Northwest and its people, particularly children, into her carving on the interior portion of the boulder. The Bainbridge Island Friends of the Library commissioned Molly for a sculpture to honor Cindy Harrison's years of dedication to the Bainbridge community and the Bainbridge Island Library as its manager. 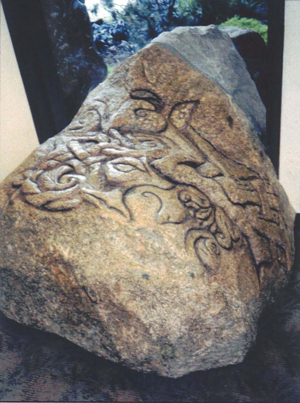 The stone is located in back of the Library and has Island motifs of a swan, star, and birch leaves. The Vikings are well known for their shipbuilding skills. The Viking Longship was tough enough to withstand stormy seas, shallow enough to sail up rivers, and light enough to be carried over land. Kings, Queens, and Great Warriors were often buried in ships. It was believed the ship would carry the dead body safely to the next world. "Helle" is named so in remembrance of a prominent Danish ceramic artist and friend, Helle Allpass, who died January, 2000. The stone is Wilkesen sandstone, the same type of stone as the pavers used in the library Haiku Garden. 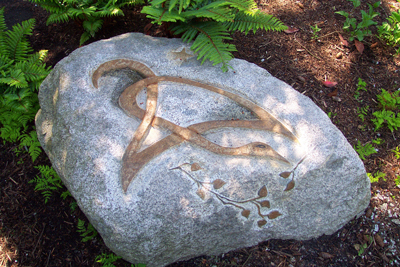 This stone, carved by Molly Greist in 2000, is located on the north side of the gazebo in the Hardy Fern Garden. 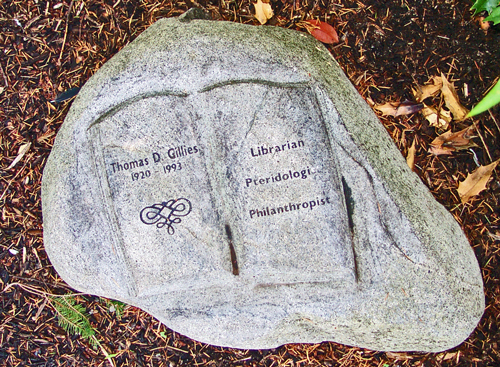 It is a memorial to librarian Thomas Gillies.